Karnataka State Road Transport Corporation jobs has published Employment News for Technical Assistant Posts. Interested and eligible candidates can have online application scheduled from 25-April-2018 Online can be registered online on the official site, all candidates are requested to submit all necessary employment related information before applying for this government job. Total numbers of vacancies are 726 Post. Only those candidates are eligible who have passed Pass in ITC/ITI/NAC in Mechanic (Motor Vehicle) /Diesel Mechanic/Auto Electrician/Welder/ Sheet Metal Worker/Electronic Mechanic/Upholstery/Draftsman(Mechanical)/ Fitter/ Machinist/ Tyre fitting/ Vulcanizing/Painting/Refrigeration and Air Conditioning/ Turner/ Automobile/ Electrical/Electronics/ Fabrication (Fitting & Welding) from an institution recognized by the Technical Board/ or the Government after a pass in secondary board education. Indian citizen having age in between 20 to 35 years can apply for this Karnataka State Road Transport Corporation jobs Recruitment 2018. Those who are interested in these Karnataka State Road Transport Corporation and meet with the whole eligibility criteria related to these Karnataka State Road Transport Corporation jobs below in the same post. Read the whole article carefully before applying. Educational Qualification: Only those candidates are eligible who have passed Pass in ITC/ITI/NAC in Mechanic (Motor Vehicle) /Diesel Mechanic/Auto Electrician/Welder/ Sheet Metal Worker/Electronic Mechanic/Upholstery/Draftsman(Mechanical)/ Fitter/ Machinist/ Tyre fitting/ Vulcanizing/Painting/Refrigeration and Air Conditioning/ Turner/ Automobile/ Electrical/Electronics/ Fabrication (Fitting & Welding) from an institution recognized by the Technical Board/ or the Government after a pass in secondary board education. Age Criteria: The Contestants applying for the post should be existing between 20 & 35 Years. 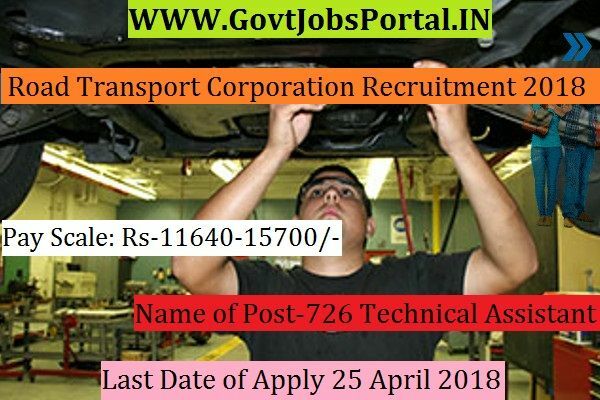 What is the Selection Process for these Transport Corporation job? 2: Applicants shall get shortlisted on the basis of Interview. What is the Application Fee for these Transport Corporation Jobs in India? The Process for applying these ITI Pass jobs in India is to apply online. There is no other way to apply these Government jobs. Below we also share the direct official link to apply. We advise all interested candidates to click on that link for online application form.